Now, normally I’d advise you to listen to that still small voice trying desperately to warn you of the evils of frozen food and the perils of being too lazy to not walk to another supermarket, but I’ve discovered something seemingly against all the odds… The Mighty Co-Op has an amazing wine selection. I’m not sure when it happened or who to thank but their range, though small, is so consistently good that I’d rather gamble blind on a bottle I new nothing about from The Mighty Co-Op, than I would from M&S or Waitrose… let alone Tesco or Sainsbury’s. That’s not to say that you can’t get cracking wines from those other supermarkets, because you can! Nor am I saying that everything the Mighty Co-Op has in its range is worth drinking… some of them still haunt me to this day *judder! What I am getting at is as long as you avoid the budget trap of paying under £5 for a wine that isn’t even on offer; your chances of getting a good solid bottle of mid-week vino are high. 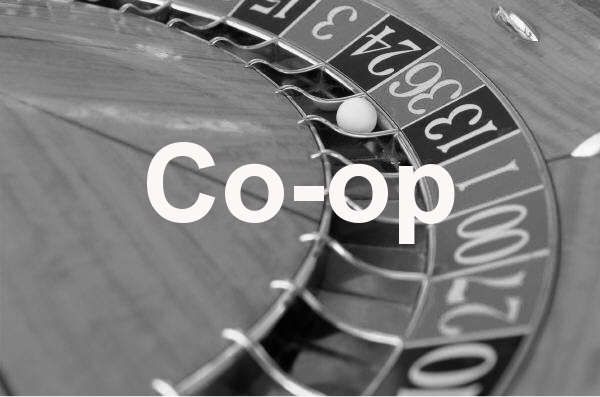 In some ways I think the larger range of other supermarkets sometimes spreads their focus too wide, whereas the Might Co-Op’s selection is centred mostly on the £5 to £10 price range with a few either side of the equation. The few that are more expensive tend to be carefully chosen examples of their type and often worth a gamble, while the ones cheaper than most tend to give you exactly what your paying for… which is a swift lesson in how not to buy wine! What I’ve found surprising is just how good so many of the £5 to £10 wines are. Not all of them by a long shot, but there are wines here as low as £6.50 at full price that are better than many wines I’ve had that were twice as expensive. 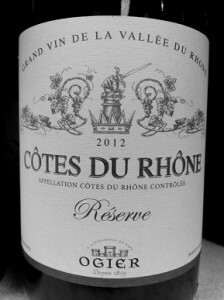 There are few wines more perfectly matched to almost any and every food related situation than Cote du Rhone (CdR). To my mind it really is one the ultimate table wines as its full bodied but soft; rich yet nuanced and low enough in tannin to handle hot spicy foods well… the perfect midweek pasta wine. There’s an interesting confusion between wines that have strong powerful flavours and those that are described as being full-bodied; where we assume that one automatically means the other… and to be honest it normally does! But there are exceptions to this… wines made in Rioja are on the medium side but have strong distinct flavours; on the opposite end of the spectrum we’ve got Cotes du Rhone that has a dense weight but a soft almost pastel like subtlety to it. So why mention this? It’s the weight of the wine that you want to try and match to the richness of your food, because a wine with too little will start to taste like dishwater. What Cote du Rhone has going for is a subtlety of flavour that won’t over power your food and a heavy enough weight to it so you’ll still be able to taste it with practically anything. Pasta, pizza, beans on toast, flaming hot madras curry… Cote Du Rhone is your friend. The Ogier Cote du Rhone has a little something extra over the average examples we tend to see, as most of them are a blend of Grenache and Syrah (with the majority being Grenache), but here they’ve added some Mourvedre into the blend… So what we have is a wine with all the soft pastel violet fruity goodness that you’d expect but with an added depth of richness to it and the result is a more complex wine over all, or at the least one where the vanilla and chocolaty aromas/flavours are closer to the surface where they’re easier for us to enjoy. Even friends who aren’t the biggest fans of Cote du Rhone love this wine and at £6.99 (full price) it’s ridiculously cheap especially when the Mighty Co-Op decides to place it on offer for even less! Update: The year a wine is made (its vintage) can make a big difference to wine and in some countries more than others. In France, this is especially true and I’m sad to say the 2013 vintage of this bottle is a real let down so far, so make sure to check the year on the label… steer well clear of it! Shiraz is something of a marmite wine these days… most will either love it or hate in a similar way to those that won’t go near Chardonnay, and like Chardonnay I think this can easily be due to a mix of being given poor quality wine on one hand and believing the bad reputation they’ve received on the other. Of course you simply may not like Shiraz! 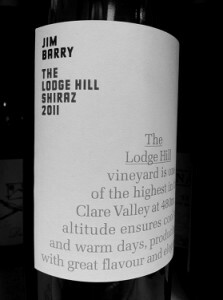 There’s so much poor Shiraz out there though that I’d hate for you to write it off before trying some the good stuff. Usually this would mean paying a little more and I am suggesting you give this a go at £9.99 a bottle, but this is one of those wines I think is well worth its price tag and if anything worth a little more. At the risk of generalising too much… the big four wines to avoid like the plague when sold at bargain prices, especially from supermarkets, are Shiraz, Merlot, Sauvignon Blanc and Pinot Grigio. In general I’d suggest that you pay more than you would usually do for these or go for something else entirely. I’m not saying you can’t find great bargain bottles of the above; just don’t gamble on something you haven’t tried… it probably won’t end well! The Lodge Hill Shiraz is a big wine and there’s no pretending isn’t, so if big wines aren’t to your taste then this probably won’t be the wine for you, regardless of how nice it is. It does manage to avoid some of the classic pitfalls of big wines though… It’s rich and dense but thanks to a good acidity it’s never jammy or cloying. It does need a good breathing before tucking into it though, so leave the bottle open for an hour or so or pour into a decanter at least 30 to 45 minuets before drinking. When it opens up it has an aroma of blackberries and caramel that leads to a palate of the same in the mouth with of vanilla and chocolate. There are tannins here but they’re soft and if anything help to counterbalance the rich density of the wine. This wine loves a good cheese and a mature gouda/cheddar will bring out the vanilla and caramel. It’s also great with cured or BBQ meats, but then it is an Australian wine so should be tried with BBQ if only on principle! This wine has a serious finish on it, leaving its flavours hanging around in the mouth for good while, perfect for a lazy conversation with friends. Riesling is another grape variety that’s been the victim of a bad reputation and customer’s experiences with cheap bottles flooding the UK market. In this case it’s possible to point to a bottle of ‘Blue Nun’ and blame it squarely for the loathing of entire nation for sweeter wines! But as with Shiraz this isn’t the grapes fault… we’re the ones who bought ‘Black Tower’ and ‘Blue Nun’ by the metric ton in the 70s, wine makers and importers simply took the hint! Believe it or not most Riesling wines are actually dry and we are starting to see more of these find their way to the UK market; especially from countries like Australia who we don’t attach the same ‘sweet wine baggage’ to in the way that we do wines from Germany. 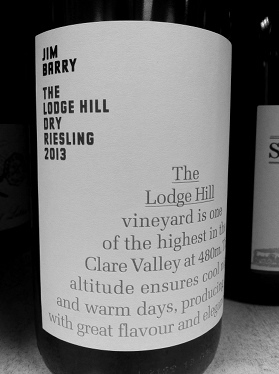 The lodge Hill Dry Riesling is, as advertised, a dry wine… so most of our Riesling prejudices fly out the window the moment you open the bottle. A powerful citrus lime aroma rises out of the glass, hinting at a firm acidity, so it’s no surprise to find that this wine does have a fresh and lively acidity to it. But if you, like me, shudder at the thought of sharp or tangy wines, fear not! The acidity here is tightly controlled and in balance with the luscious weight of the wine, like the missing piece of an elaborate puzzle… it simply fits. The aroma is backed up on the palate and expanded upon with a greater variety of citrus fruit moving from lemons and limes to orange fruits. As with the ‘Lodge Hill Shiraz’ above, this wine has a good long finish on it hinting at quality and intensity of the grapes used to make it, so priced at £9.99 it’s a good example of what you can find when you’re willing pay a little extra. This is a great wine to have as an aperitif or on a baking hot day ice cold from the fridge. If you normally drink Pinot Grigio, give this a go; it could open up a whole new world of dry whites for you. There really is no getting around the fact that this wine is practically unpronounceable… I’m dyslexic and just looking at the title above is enough to give a headache! My friends and I decided we were going to start referring to Gewürztraminer as ‘Girdle-Trimmer’ to make it easier to remember, which while helpful turns out to have a fatal flaw; do not whatever you do ask for ‘Girdle-Trimmer’ in a supermarket… you’ll be directed to the personal grooming section! 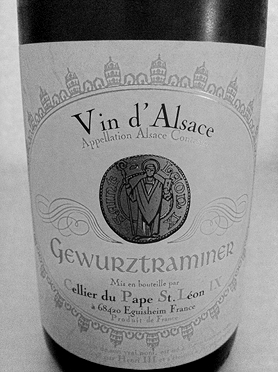 Gewürztraminer is a grape that makes seriously aromatic wines. Imagine a flower with a strong scent to it that fills a whole a room with its fragrance simply by being there. That’s what wines made from Gewürztraminer are like… at least in comparison to other wines out there. They’re almost always made in an off-dry style which means that there is more sweetness than you’d find normally in wine rated 2 on the dryness scale but still less than you’d find on many others. If you’re a fan of dry white wines and really don’t like even a hint of sweetness, then this might not be wine for you. But please don’t jump to that conclusion too quickly! These wines perfect for matching foods that have a hint of sweetness to them, like Chinese or Thai food… and when drunk with those you find that the sweetness balances out and leaves you with a lovely dry wine. More often than not, if you start out with a dry wine and drink it with sweeter food, you’ll end up with a glass of acid. Everything has it place. This Gewürztraminer has all the classic hallmark aromas of the variety, like lychee, orange blossom and honey and all of them pour on to palate, especially the honey, with a full viscous like texture to it that coats the mouth and helps to give this wine a lovely long finish. Having talked about the slight sweetness of Gewürztraminer’s, this one in particular is actually dryer than average, which is why I thought it would be a good introduction for those of you yet to try any. The next time you have a Chinese take away or a Chicken Tikka Masala, give it a go. Thank you for reading my thoughts on the mighty Co-Op, I hope it’s been helpful. Please let me know when you think. Next up we’ve got Tesco vs. Sainsbury’s.